After thinking about this for a long time and looking at a bunch of preliminary considerations ( which I wrote about earlier ), I was ready to figure out how to actually do this. I read up about the different approaches to this and the simplest one seemed to be the one where you “burn” your feed URL on FeedBurner and then submit to iTunes. 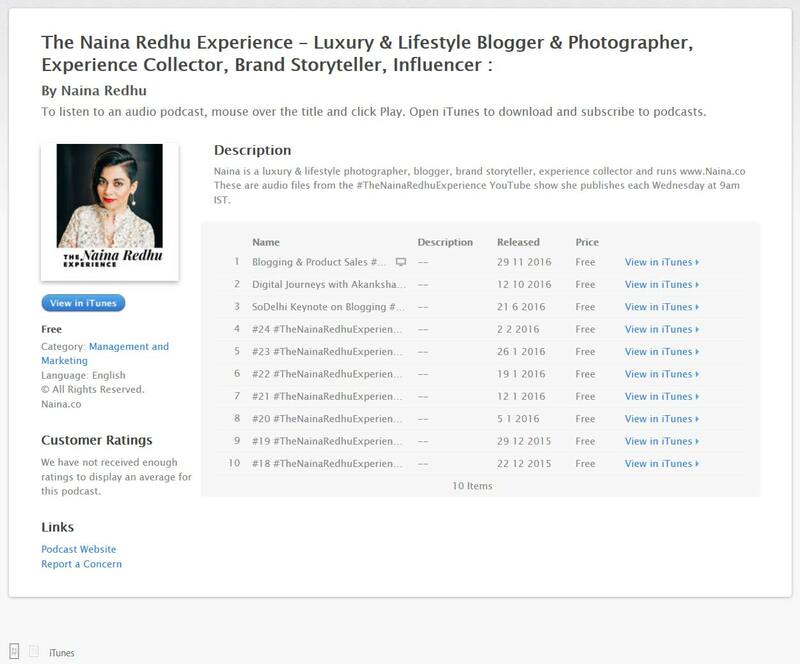 The #TheNainaRedhuExperience series existed under a Category on my WordPress blog already. I needed to pull out the RSS feed for this category and this category alone. This is simple. You look at your blog’s RSS feed. 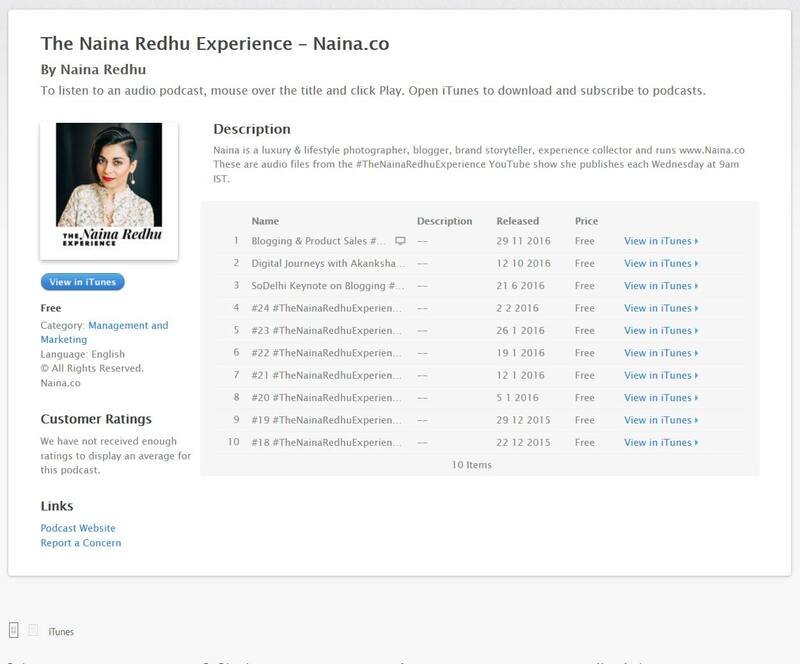 It should be something like this : http://www.naina.co/feed ( Blog url / feed ). 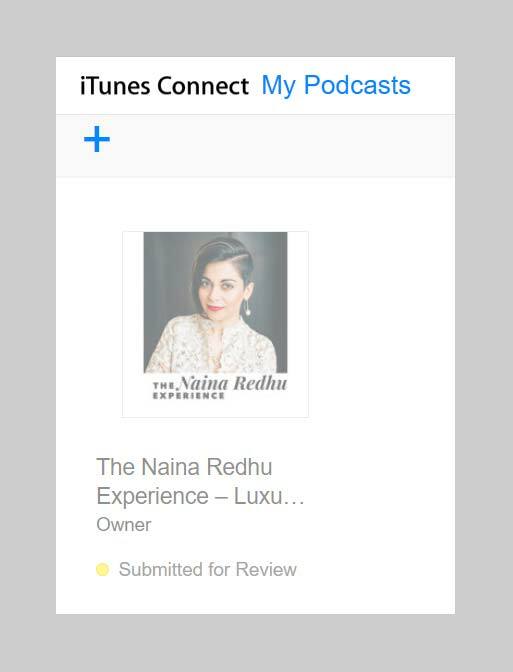 You take the URL of your blog’s category like so : http://www.naina.co/category/thenainredhuexperience and you add /feed at the end. 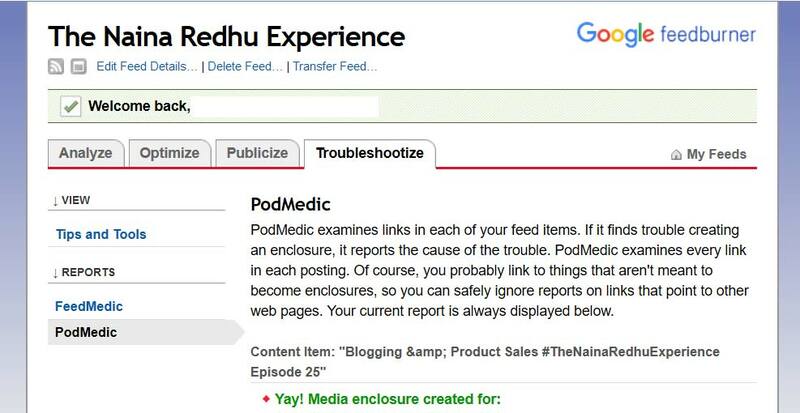 Like so : http://www.naina.co/category/thenainaredhuexperience/feed THAT is your category’s RSS feed. There, I entered the FeedBurner RSS feed and not the category feed from my blog directly. This is because FeedBurner has the option of parsing the XML of your feed in a way that iTunes recognizes it. If you don’t use FeedBurner, you need to know how to code. I know how to code but I didn’t have the time to learn all the nuances and ins and outs. I just wanted to get it done after having sat on it for months. If you’re not familiar with FeedBurner, the UI is very old-school. It can seem simple but there’s a lot going on under the hood. Click around and explore. Once I’d uploaded the artwork and figured out the categories to use for my podcast feed, I went back again to iTunes and hit “Validate” again. iTunes told me it was unable to download episodes from my feed. I couldn’t figure out what was wrong. 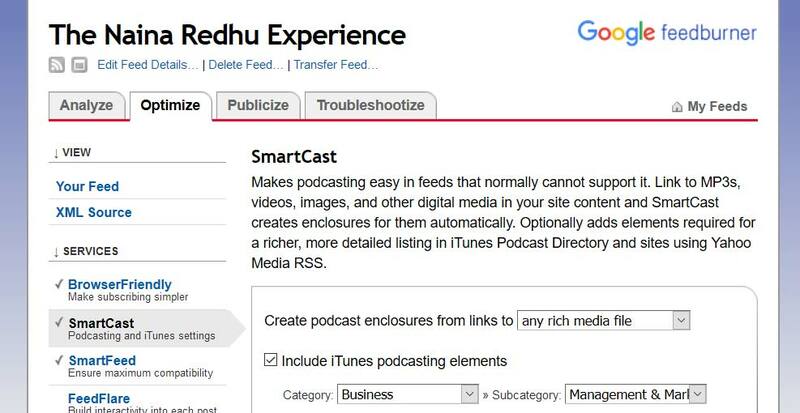 I clicked around a bit more on FeedBurner and found “PodMedic“. This showed me that it was not being able to parse the audio files and was reading everything as HTML / text. It should have been reading the uploaded MP3s as audio / MPEG but it wasn’t. And I didn’t know why. A little more digging around on Google threw up an interesting thread on Reddit where one of the solutions to the above problems was to remove the spaces in the MP3 file names. I checked all the MP3 files that I had uploaded and sure enough, lots of spaces. I went back to iTunes and hit “Validate” and this time it cleared the feed. All I had to do then was hit “Submit” and wait for their approval email. iTunes took a couple of days to approve the podcast and it is now on iTunes here! I wasn’t happy with the automatically generated URL and after much searching on Google and on the Apple help forums, realized there was no way to change this. I also wanted to change the description, which was easy enough to do : change it first on the blog, then check if FeedBurner has refreshed it and then submit the podcast on iTunes for a refresh. It says to give it 24 hours for the changes to reflect but the changes showed up within the hour. This is how it looked before the change in title. And after change of title. And here it is, in the iTunes app, in the iTunes Store! So, there you have it! I have a podcast. Don’t forget to add a link to your podcast’s iTunes URL wherever your readers most visit you online. On the blog, share it on your social media channels, etc. But most of all, do record consistently. I hope I will be able to apply this advice to my own podcast! In Part I, last week, I shared what my preliminary considerations were, prior to attempting a podcast. This above was Part II. In Part III, next week, I talk about the equipment and my workflow, which will wrap up this series on how I got started podcasting!